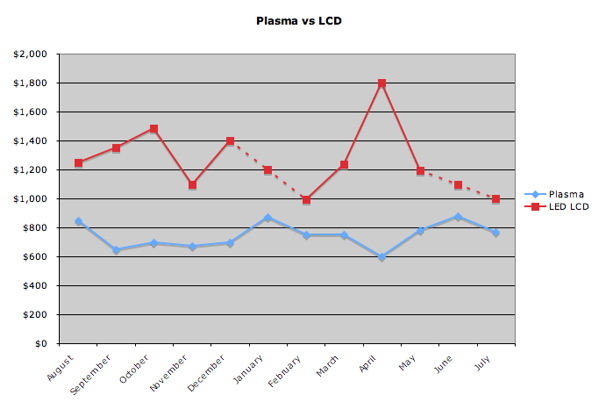 LCD TVs Win the Popularity Vote Against Plasma, But Which is The Better Deal? LCD TVs have become the format of choice for flat-screen TV buyers. However, despite their market dominance, LCDs have yet to give plasma TVs their final death blow. And that's a good thing, because when it comes to pricing (specifically on 50" 1080p sets), plasma TVs trounce their LCD competitors. In fact, in the past year, not once has a 52" LED-backlit LCD sold for less than a 50" plasma. (Due to the scarcity of 52" plasmas and the lack of 50" LCDs, we compared 50" plasmas to 52" LCDs.) Sure, you're getting 2" less screen real estate with the plasma set, so it's natural for them to be cheaper. But deals on 52" LED LCDs have remained in the $1,000+ range, whereas deals on 50" plasmas have for the most part remained under $800 — a significant amount of savings for losing just 2" of display. So, if you're longing to make a big-screen TV the center piece to your home theater system, consider the deal-rich plasma option. 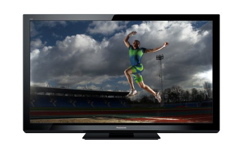 Like all technologies, plasma TVs have their advantages and disadvantages. On the plus side, plasma TVs have consistently outperformed LCDs with regards to picture quality. They deliver deeper blacks and don't suffer from motion blurring. In fact, CNET's best HDTV of 2011 is a plasma TV. So as far as image quality is concerned, plasma reigns supreme. Now for the bad news. Unlike today's razor-thin LCDs, plasma TVs are generally bulkier. They're also known for using more power than LCDs, although many of today's newer plasmas meet stricter Energy Star guidelines. And while it's true that some manufacturers have pulled out of the plasma market, it's also true that many companies such as Panasonic and Samsung remain big proponents of plasma TVs showcasing new models every year at the Consumer Electronics Show. So in the end, the only true con to plasma TVs is their slightly bulkier size. What Prices and Features Can You Expect? Today's plasmas pack the same features found in modern-day LCD TVs like app store support, 3D processing, Netflix streaming, Internet access, and more. Plasmas with 720p resolution are roughly $100 cheaper than those with 1080p resolution. And for reference, July's best plasma deal came in at $770 for the 2011 Panasonic TCP50S30 1080p plasma with built-in WiFi (pictured). As we approach Black Friday, we expect to see TV prices plummet across the board, but 50" plasma TVs in particular will reach astonishing lows as they try to beat April's all-time low ($599 at Fry's). Compare that to the best deal we've seen on a 52" LED LCD ($979 at BeachCamera via eBay Daily Deals), and you'll see where the real savings are. If you're in the market for a big-screen TV, you'll get the most bang for you buck from a 50" plasma. Sure, LED-backlit LCDs are hot right now, and they might even look sleeker from a design perspective, but on average plasma TVs still outperform LCDs. And with their much lower price, there's simply no reason not to invest in them. Ready to put this information to use? Check out our section of daily HDTV deals, or set up an email alert to know immediately when we list the item of your choice. *This data is based on deals listed on dealnews.com, which represent low points, not averages. Shipping prices (where applicable) were factored into the pricing in our data. Points on the graph represented by a "-" indicate there were no deals for that month. An avid gadget lover, Louis Ramirez has covered technology for Gizmodo, CNET, Laptop, and various other publications. Follow him on Twitter at @LouisRamirez. You can also sign up for an email alert for all dealnews features. I'll never understand why somebody pays $1000 for a 50+" TV and then worries about the power consumption. Go to Wal-Mart and buy a 19" LCD and be done with it, save yourself all kinds of money. Look, if 'dealmuse' wants to pay more for a TV and watch a crummy LCD picture, simply because he believes he's saving the planet through a little less power usage - go for it!! Just don't legislate my plasma from me through green initiatives, because the plasma picture is clearly and provably superior. Also take this into consideration. What is the price difference between the two TV's? Now what is the energy consumption for both TV's. Most likely the difference of price between the two TV's is more than enough to power the Plasma for at least 3-5 years. So you can get the plasma, use the money you saved from not buying the LED TV, pay the electric bill for that TV for at least a few years and you won't have to worry about the higher energy cost. Especially since the new plasma TV's are more energy efficient and after 3-5 years it should be about time to buy something new because technology is always changing. OK, I checked the July's best plasma deal mentioned above and it comes in at 339 watts. Still 3x the consumption of the LED but definitely more reasonable with the newer sets. So 200 watts more * 8 hours a day = 1600 watts * .10 per kw = 16 cents a day * 365 days = about $58 a year more to run the plasma set if it's on 8 hours a day, every day. In my case it'd be on about 4 hours a day so it's an extra $30 a year. Not a big deal for me. That's a 3 year old plasma set. I'd be very interested in the power consumption of a 2011 50" plasma set because they are supposed to be more energy efficient. "...there's simply no reason not to invest in them." My 50" PLASMA Panasonic TH-50PZ800U draws 535 watts. My 55" LED LCD Samsung UN55C8000 draws 129 watts. = about $100 electricity savings per year. And you have the audacity to use the word "INVEST". Plasma was also the shootout winner in 2010 and 2009.